Tropes can be exhausting. When every book you read features secret princesses, loveable rogues, and an extensive fake relationship charade, it’s easy to get tired of the gimmicks. But tropes aren’t all bad — done correctly, they make a comforting framework in which to tell an innovative tale. Don’t disparage a book just because it leans hard on an overdone trope. These six books transform old, tired tropes into works of art. Two characters with steamy sexual tension travel together on their quest to banish evil. Cue: the ratty old motel room, or the ancient battered castle, or — like in Emily Skrutskie’s The Abyss Surrounds Us — a cramped ship. There’s a reason writers love making their characters share a bed. There’s no better way to turn tension into a full-blown volcano than stuffing your main character into a too-small bed with a potential love interest. Until every other author tries the same tactic. Suddenly, a clever gimmick becomes a trope. But Skrutskie uses this trope elegantly in her tale of pirates and genetically-modified sea monsters. Yes, Cass and her swashbuckling love interest Swift share a bed a mere five chapters in — and it’s the purest, most cinnamon-roll route to love we’ve ever read. Sure, “two characters sharing a bed” may be a guilty pleasure, but think of it like your grandmother’s apple pie: in Skrutskie’s hands, it tastes really, really delicious. This trope existed long before Jenny Han blessed us all with the tale of Lara Jean — both Anne of Green Gables and Mr. Rochester used fake relationships to get ahead — but To All the Boys I’ve Loved Before is the magnum opus of pseudo-boyfriends. One of the reasons this trope works so splendidly is because Han layers it with a love trial. (In the book, but less so in the movie.) Lara Jean and Peter Kavinsky’s will-they-won’t-they relationship keeps readers invested, and Lara Jean’s unique first-person POV makes every high feel magnificent — and every low feel truly tragic. By the end of the book, readers desperately want her fake relationship to become very, very real. Oliver Twist may have been the original rags-to-riches tale, but Marie Lu’s Warcross does the trope right. Emika Chen starts this twisty tale of hacking, video games, and virtual reality in a shabby, broken apartment — and ends it with wealth and fame. What makes this insta-fame arc work? Emika’s rising celebrity is set against a fast-paced, action-packed tale. Often these stories are slow: the long and tedious rise from poor peasant to rich aristocrat. But Warcross sets Emika’s ascending stardom against a tense story of hackers, spies, and hidden weapons. We know Emika deserves the money, the notoriety, and the super-hot boyfriend — but Lu’s richly imagined world makes us wonder if fame is worthy of Emika. Young adult fantasy is rife with stories of secret royals. But before we had Aelin Galathynius, we had Linh Cinder. (Okay, fine: Marissa Meyer only beat Sarah J. Maas to market by a matter of months.) Both series are fantastic takes on the “secretly royal” trope, but we’re a little extra in love with Meyer’s Cinder because it take the trope to a new location: the future. Cinder isn’t stuffed with castles and stuffily dressed queens, although there’s no denying its fairy-tale roots. Linh is a super-cool cyborg living in a futuristic version of our own world ravaged by an incurable illness. Revealing exactly who the secret royalty is or what they are secretly royalty of would venture into spoiler territory. But needless to say, this fascinating take on an old trope makes us all wish we were secretly royal — and openly cyborgs. Adam and Gansey are no Edward and Jacob. That’s a good thing. We thank Twilight and The Hunger Games for introducing us to the idea of love triangles — but we also hold the two blockbuster series responsible for making everyone tired of the trope. And it’s a great trope. Just a wee bit overused. Maggie Stiefvater’s modern masterpiece, The Raven Cycle, is a quieter and subtler take on the traditional love triangle. The Raven Boys and its sequel are more about friendship and family than love and lust — but there’s enough romantic tension (and a totally surprising, un-love-triangle-like ending) to keep your heartbeat pounding. Mackenzi Lee’s brilliantly crafted tour-de-Europe tour-de-force, The Gentleman’s Guide to Vice and Virtue, stars a classic lovable rogue — and the novel is better for it. Henry “Monty” Montague may be a self-obsessed scoundrel, but we dare you to read 15 pages without falling in love. Monty’s romp through Europe is pure fun. Most of that reason: Monty himself, who manages to be adorable and roguish, a troublemaker and a sweetheart. The rest of that reason is Monty’s love interest, the utterly perfect Percy. He makes a fabulous foil for Lee’s waggish Monty, and together, they’re the MVP OTP. 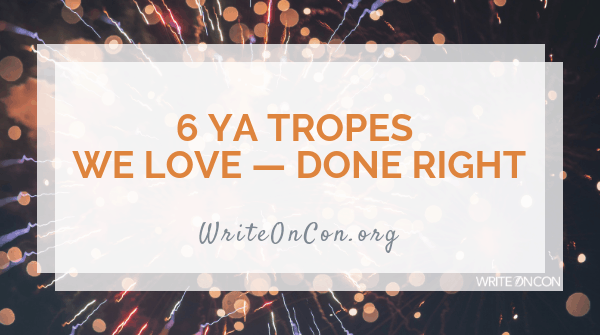 What are some of your favorite tropes? Which books do you think do potentially tired tropes well?